Following Laura's idea of an infrared coffin mentioned here, we started building the contraption. It is very much like a tanning bed except that instead of generating UV lights, it generates near infrared lights. I didn't know that we would publish such a project, so I only have pictures of the finished product. But if one of you wants to build such a device, it's not too complicated. I provided some explanations in the photo tour below and I can provide extra details if required. Structurally it is a bed (a frame + a board + 6 legs) to which two posts are attached. Those two posts hold the top panel. In the top half of each of the two posts, six equidistant holes have been drilled (blue arrows in the picture below). 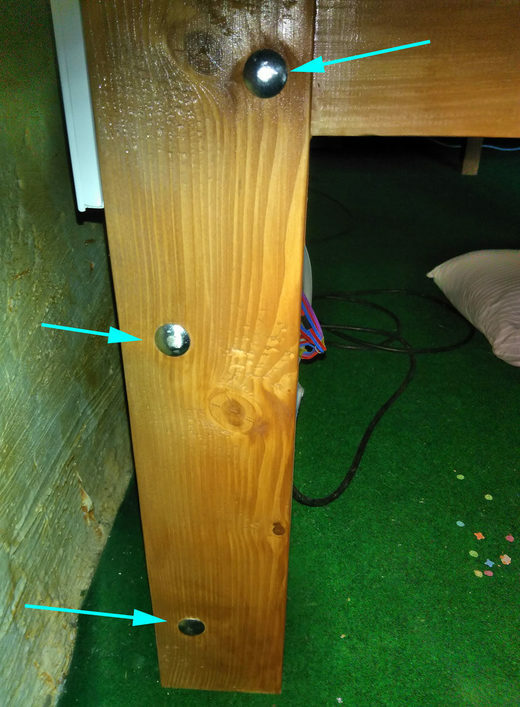 Those holes allow to adjust the height of the top panel with the knob screw (green arrow). This feature was implemented for our bed because we have people of various size, but it is not a necessary feature at all. 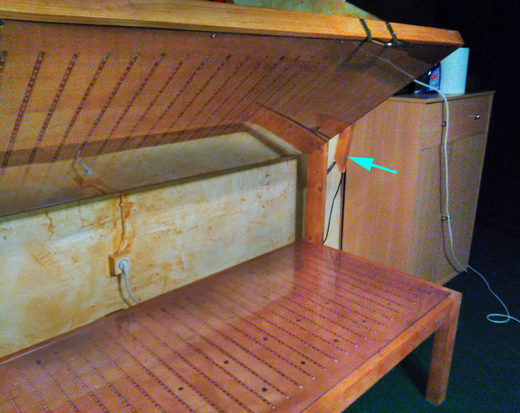 If you design such a bed make sure the top panel is as close to you as possible because near infrared lights lose power very quickly over short distances. Below is a picture of the infrabed in an opened position. 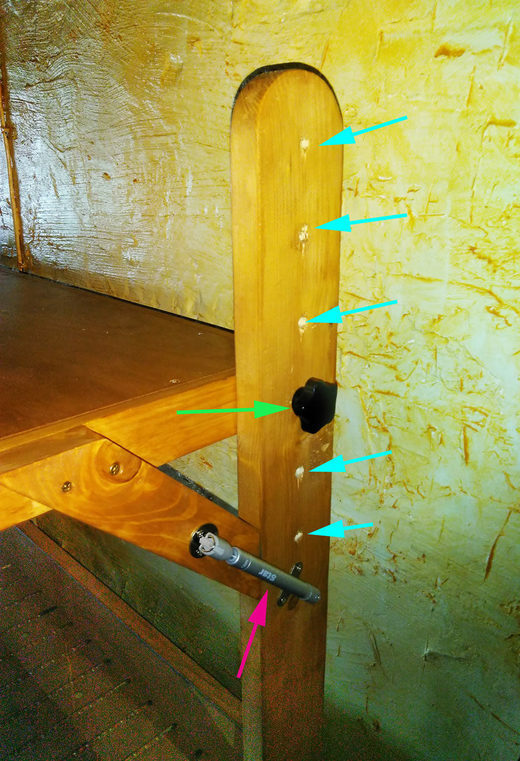 Notice the diagonal piece of wood (blue arrow) on which the top end of the gas spring is attached. 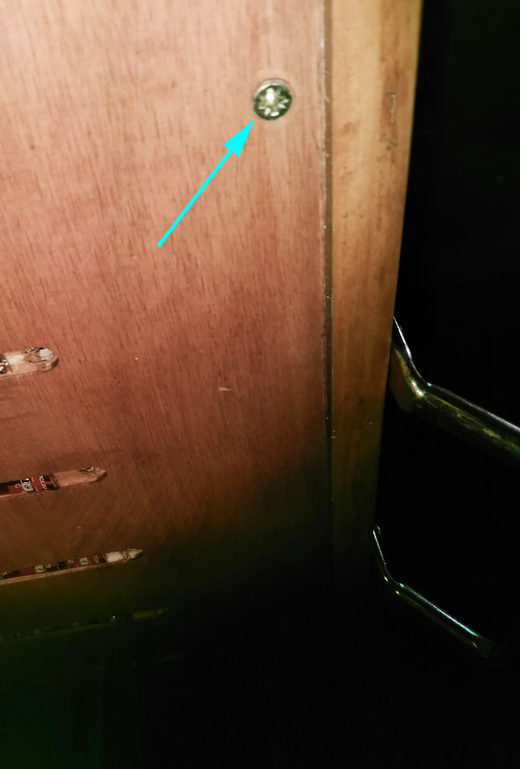 This diagonal piece of wood acts as a stopper when the top panel is in a closed position. On the right is a red light that indicates that the bed is on. 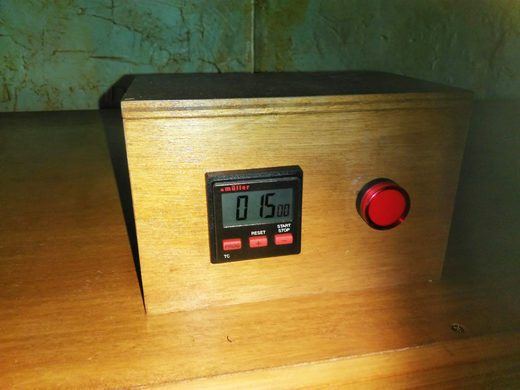 On the left is a timer that will run the bed for a given time. Here, it's programmed for a 15 minutes cycle. 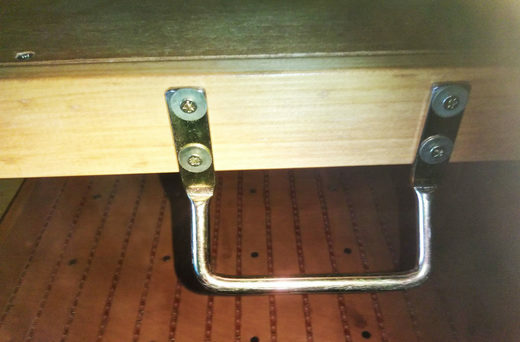 Below is a picture of one of the two handles, which have been installed to ease the lifting/dropping of the top panel. The top panel and the bottom panels are made of plywood. 5/8'' - 15mm thick for the bottom and 3/8'' - 10mm thick for the top. 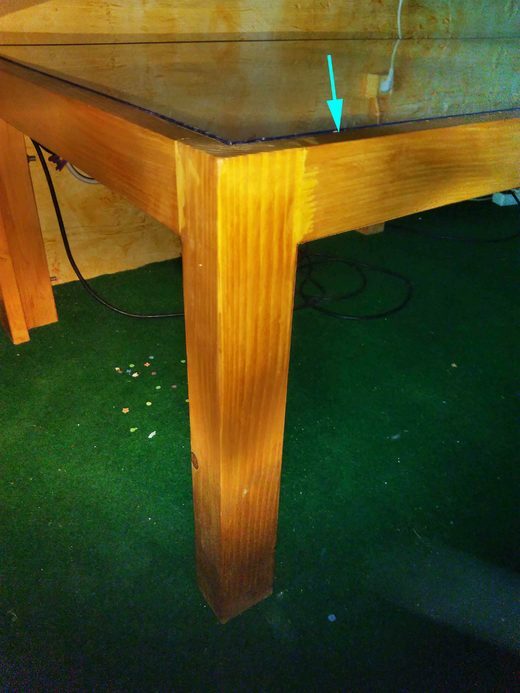 In those plywood sheets, equidistant dados (grooves) have been made. There's about 42 mm ( 1 3/4 in) between each groove. As shown by the blue arrows, the grooves are 9 mm wide (1/3''). They also are 3mm deep (1/8''). There is a total of 36 grooves in each panel (top panel and bottom). You can buy those spools from Aliexpress. Each spool is 5 meters (16ift) long. 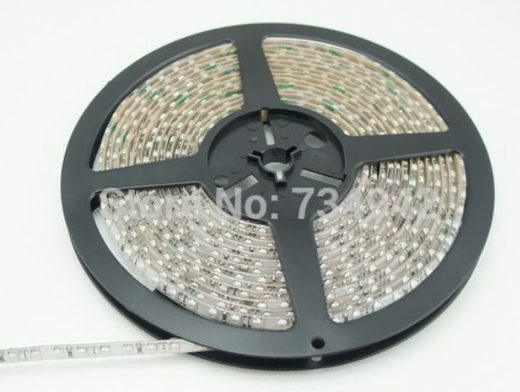 There are 60 LED per meter. We bought 9 spools for a total of 45 meters. We cut the strips in 72 sections of 60 cm (2 ft). So, our bed has a total of about 2600 LEDs for a total consumption that is around 200W. 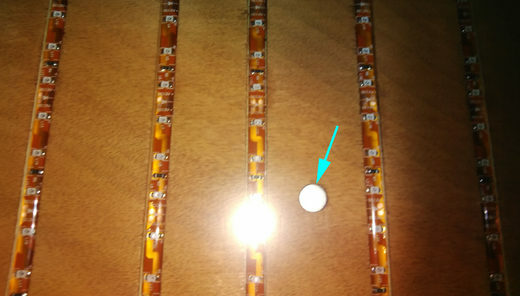 The strip come with double side tape on the back which makes the installation very easy. You can pick one of three strip colors: black, yellow, white. We chose yellow because it matches the color of the bed frame (golden oak). The whole bottom panel has a total of 48 magnets. The South pole of the magnets faces up. To determine the polarity of the magnet, you can use a compass, the south pole of the magnet will attract the North (usually red) handle of the compass. Each magnet was mounted in a pre-dilled hole and glued down with epoxy resin. The image above shows the underneath of the bottom panel. 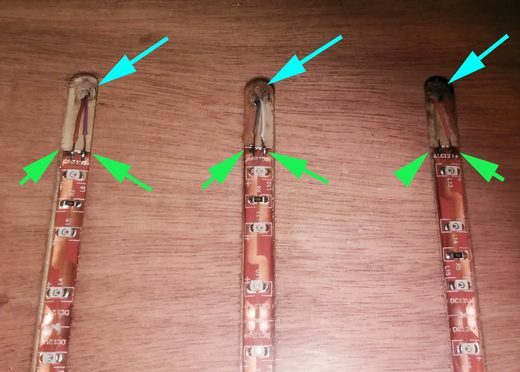 The pairs of tiny wires are indicated by the green arrows. they are connected to the + and - rails (dark blue arrows). 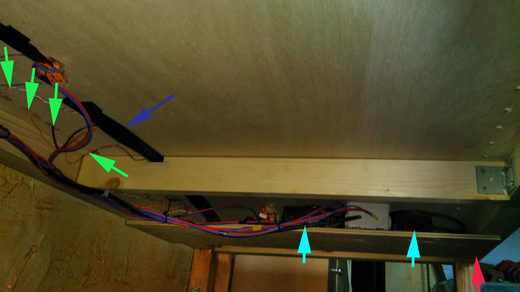 Those rails are, basically, stripped wires which were taped over for insulation (hence the black color) and they are connected to the power supply: two AC/DC converters (see blue arrows), one for each panel. For convenience we installed a small shelf (see pink arrow) under the bottom panel in order to store various electrical components. 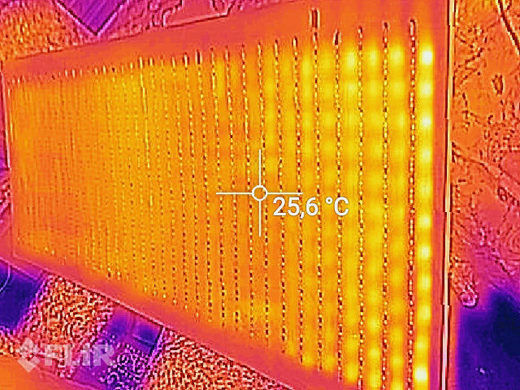 As you can see the temperature is homogeneous, the LEDs are not warmer than their environment. 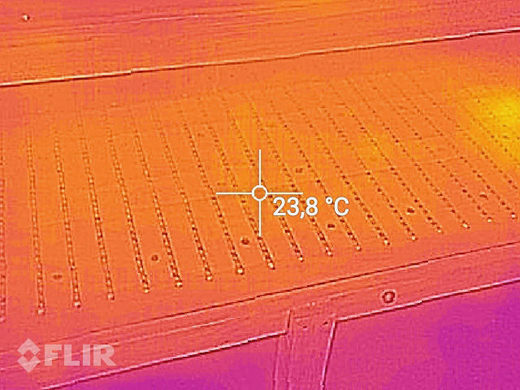 Below is a thermal picture of the infrabed while it's on and it's shining like a Christmas tree! So we know that all the LEDs are working fine! It all looks fantastic Great work!!! Just thought I would emphasize the reason for the thermal image photos; when the "lights" are on, you don't see anything and you don't really feel anything; the light is invisible and cool except when you view it with the thermal imaging camera or an infra-red night vision camera/scope. I spent 15 minutes in it today and I do feel a bit perkier, but that's all I can say at the moment. That is brilliant Pierre! This is a must in every home. I was thinking it would have to be a hammock of some sort to let the FIR through. That looks amazing! Thank you for sharing. How much did it cost to build? 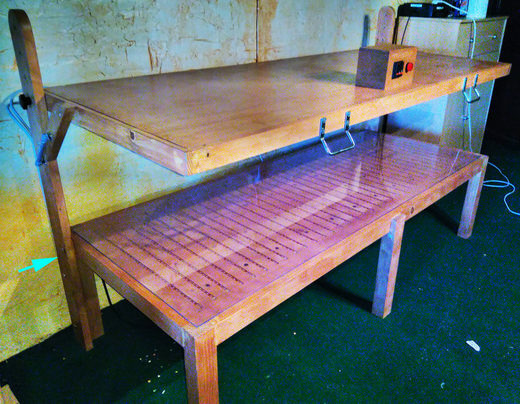 Really cool and gorgeous craftsmanship as usual, thanks for sharing! That's a total of roughly 780 euros ($700). It is not cheap but the price per user, knowing that we'll be a bunch testing this device, is much lower. I think it's possible to drop the price by removing the top panel: just having an IR bed (bottom panel) on which one can lay alternatively on his back and on his tummy. Wow, looks really professional! Nice work. Unfortunately that it is too much money for me at the moment...but I would like to try it just to see the effect. Great job Pierre. It will be really interesting to hear of any health benefits from using it over a period of time. Is everyone at the Chateau intending to use it? Really enjoyed the photos and descriptions. .....and for only 780 euros ($700) too! 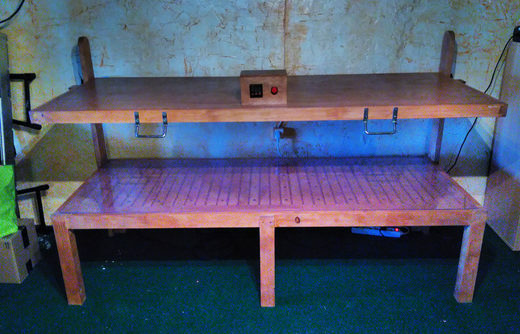 Just did a quick internet search and found this Pain-X Infrabed Light Therapy Bed for $24,950.00!